Learn step-by-step how to work with your Excel Workbook. Learn how to create a new workbook, and to save, open, close or delete the workbook file. When you save an Excel workbook for the first time, Excel displays its Save As dialog box. When you save the same workbook anytime after that, Excel overwrites the previous copy of the file. 1. Choose File ► Save from the menu bar to access the Save As dialog box. If the file has not yet been saved, Excel prompts you for a name using its Save As dialog box. What 's the difference between Save & Save As? 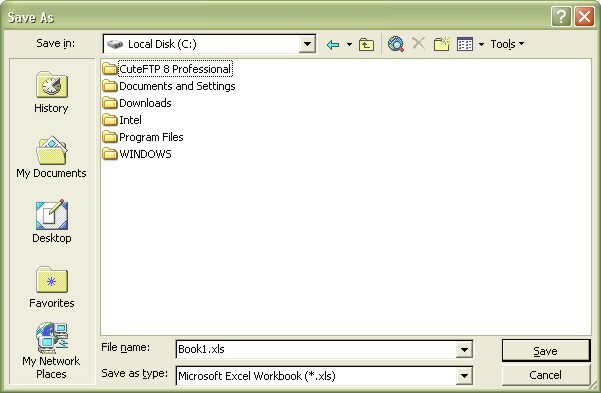 Save As is used to save a workbook for the first time to give it a name or to give a saved workbook file another name. Save is used when the workbook already has a name, and you just want to save the adjustments with. You can also click the Save button on the Standard toolbar. OR you can press CTRL + S OR SHIFT + F12 on the keyboard. 2. From the Save In drop-down list, select the folder that will hold the file. 3. Enter a name in the File name box. (A filename can consist of as many as 255 characters, including spaces). You should save your work at a time interval that corresponds to the maximum amount of time that you're willing to lose. For example, if you don't mind losing an hours work, save your file every hour. Most people save at more frequent intervals. Sometimes, you may want to keep multiple versions of your work by saving each successive version under a different name. You can save your Excel workbook easily with new names. 1. Choose File ► Save As from the menu bar, to display the Save As dialog box. 2. From the Save In drop-down list, select the folder in which to store the workbook. 3. Enter a new name for the file in the File Name box. A new copy is created with a different name, but the original version of the file remains intact.